Food retail in the UK is set to for a huge shake up as Walmart-owned Asda and J Sainsbury are planning to merge, which creates a new behemoth in the supermarket industry. 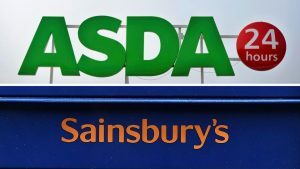 The Asda and J Sainsbury deal is estimated to be worth £15 billion or approximately $20.67 billion, and was confirmed on Monday morning in the UK. If regulators approve the deal to would surpass that of Tesco which is the largest UK retailer with a market share of 25%. The two companies are currently the second and third largest retailers. Given how big the two companies are, regulators must assess if the merger would create disruptions in the market. The CFO at Sainsbury’s Kevin O’Byrne said they consider the combination of the two to be great and will create a dynamic player in the market. The grocery store market has changed drastically the last decade and more so the past three years, with discounters doubling in market share and others entering the market that could not have done so just a few years ago, said the CFO. The merger will maintain both Asda and Sainsbury brands and the companies said that Walmart, which is the parent of Asda, will hold 42% of the share capital of the new entity and would not hold over 29.9% of the overall voting rights. They said as well that the new combined business would generate at a minimum £500 million or $688.60 million worth of cost savings and create a lowering of prices of approximately 10%. J Sainsbury shares were higher by 20% when markets opened Monday in Europe. One analysts in food retail said the scale remains the biggest factor in profitability in food retail. Across Europe a frenzy of mergers has been seen in the food industry, as companies attempt to fight an increase in competition from the e-commerce sector, including Amazon. Both Asda and Sainsbury have struggled in sales growth and that has weighed on the ability of them to get less expensive deals with their suppliers. The merger allows the new entity to give much better value to its customers in the very competitive market with discounters and online businesses said a statement released by the companies. The competitions authorities will now assess the deal and could take up to a year for the deal to receive their answer.